Can I update App Store settings instantly? Almost every part of your branded app is designed to be instantly updatable, but App Store settings are the lone exception. Those settings are hard coded into your branded app and become part of the App Store which means Apple and Google need to review any changes. 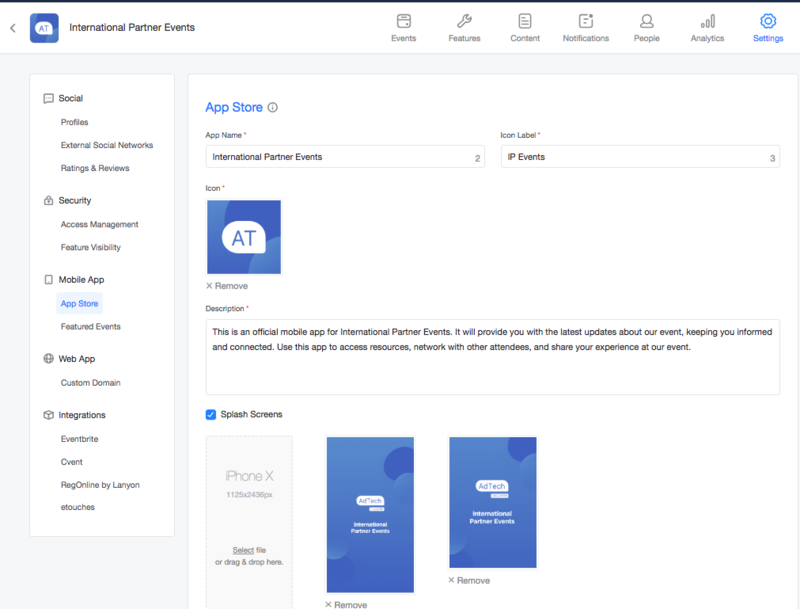 Please double check your App Store settings (app name, icon, icon label, description and splash screens) before submitting your branded event app. You can make changes later but changes can take 2-3 weeks for review and approval and incur a $199 fee to rebuild and resubmit your app. How do I request an update? To request an update of the App Store settings click on the "Manage" button next to your app on the dashboard, then click "Settings" and "App store" as shown in the screenshot above. When you're done configuring your new settings click on "Pay and Submit" and we'll send the update request on your behalf. After you submit your app, updating the app name, icon, icon label, description, or splash screens costs additional $199. Will requesting an updated affect the availability of my app? Requesting an App Store update does NOT affect the function of your app, your app will continue to function as normal while the update is pending. Please note that this only applies to Branded Apps. Apps in the Attendify Container App do not have splash screens or any app store details.